Julia Boone, CDV volunteer enjoys the Hacienda playground and some hugs!It’s just so much easier in December. Salvation Army Santa’s standing in front of the store, just drop your change in the bucket. Giving Angel Christmas trees in the middle of the mall, what’s one more gift on the list? Someone from the office organizes sponsoring a family’s Thanksgiving dinner, add a couple of cans of green beans to the holiday shopping list. Helping the needy has always been a traditional part of the holiday celebration, right up there with roasted turkey and silver tinsel. But what about those other 10 months of the year? Not surprising, but the need for volunteers and donations continues year round, it just might be a little bit harder to find. Luckily, we’ve done all the research for you, now all you have to do is pick up the phone (or click on the computer) and get out there and help! If you’re one of the hundreds of San Clementeans who has helped sponsor a needy family for a Thanksgiving or Christmas dinner, chances are you did it through FAM or Family Assistance Ministries. FAM is one of San Clemente’s best known charitable organizations, and they are definitely most visible during the holidays. The annual “Hunger Walk” raises thousands of dollars used to host community Thanksgiving, Christmas and Easter meals for those in need. FAM also coordinates individuals, businesses and service organizations who wish to “adopt” a family and provide them with meals and gifts. Many of us around town have cooked an extra pumpkin pie or wrapped an extra toy and dropped them off at the community center for FAM’s annual Christmas party where over 800 local kids celebrate Christmas with a delicious feast and a visit from Santa. What you might not know, is that after the last Christmas gift has been unwrapped and the last morsel of pumpkin pie has been devoured, FAM volunteers continue to serve the community in a myriad of ways. Over 3,000 local families in need can receive vouchers to help pay monthly rent, gas or electricity bills. Local seniors can get help paying for costly prescription drugs. Each month over $30,000 worth of food is handed out through FAM’s food bank Local homeless shelters, domestic violence shelters and Meals on Wheels receive bulk donations of food from FAM on a weekly basis. The list goes on and on. According to volunteer coordinator Jan Cleaves, the list of volunteer opportunities also goes on and on. Located in the San Clemente Business Park FAM operates an office and food bank where volunteer help is always needed, anything from answering phones to stacking, sorting and distributing “FAM Bags”. A serious need is the arms of a few good strong men. A call comes in from a local grocer with a pallet of food to donate to the food bank or a new refrigerator for the local homeless shelter and Jan is left to scramble for someone who can do the heavy lifting. “We have a donated truck for picking up large donations and we’re always looking for someone to drive it and help with the heavy loads” said Jan. If any of these sound like a job for you, contact Jan at 492-8477, and she guarantees you will come away feeling as blessed as those who receive your help. 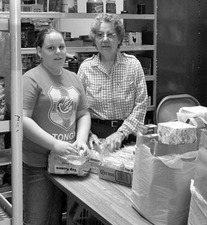 FAM volunteer Alice Millsap and granddaughter Kirstin Johannsan. .If your feelings run a bit stronger towards helping the four legged instead of the two, the Pet Project Foundation may be for you. The Pet Project Foundation is the all volunteer, non-profit support group for the San Clemente-Dana Point area animal shelter. Although the San Clemente animal shelter receives basic funding and staffing from the city, it is this dedicated group of volunteers that maintains the shelter’s reputation as the “best place to adopt a pet” in Orange County. Logging over 26,000 hours of service, Pet Project volunteers provide lost or abandoned animals with shelter, food, medical help, exercise and love. As a volunteer you have the opportunity to hug and hop a bunny, pet and love a cat, or walk and talk to a dog. You can also work at the front desk of the shelter or work at one of the shelter’s many fundraising events. These events include the widely anticipated Wag-a-thon, the Santa Claus and Paws or the San Clemente Fiesta Street Fair. Always in high demand are homes that are available to foster a pet with special needs. Maybe it’s a puppy who’s lost its mother or a cat recovering from a surgery, these foster care situations can last from as little as a few days to as long as a few months. There is no cost to you and all food, medicine and training is provided by the foundation. So whether you have a few hours a week or are willing to open your home for a couple of months, the Pet Project is looking for you. 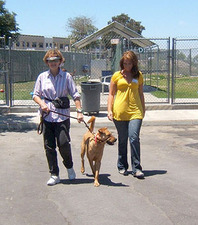 Contact them at (949)492-1617 or download a volunteer application at www.petprojectfoundation.org. Maybe you like your volunteer activities to have a more global feel. In that case you should give Corazon de Vida a try. Corazon de Vida (Heart of Life) is dedicated to supporting the orphaned, homeless and abandoned children of Baja Mexico. Through the sponsorship of local orphanages in Tijuana and Rosarito Beach CDV helps provide housing, food and social programs for thousands of Baja’s most vulnerable citizens. Of course monetary donations are always the most pressing need, and CDV offers many levels of support ranging from one-time donations to corporate sponsorship of entire orphanages. But CDV offers a chance to do more than give from your wallet, they also offer an opportunity to give of yourself. Twice a month CDV runs a bus from Los Angeles to Tijuana with stops in Irvine and San Diego. Once in Mexico, the bus will take you to one of the many orphanages sponsored by CDV, for a day you won’t soon forget. After a brief tour of the orphanage, where proud employees point out recent Volunteers walk dogs at the Animal Shelter.improvements like a new indoor toilet or the new cribs recently donated to the nursery, the floodgates open and out pour the children. Sometimes as many as 100 of them. Many will want to play soccer or basketball. Some will want to be pushed on the rickety old swing-set up in the courtyard, and some will sit down beside you to share a book or a craft. Many will just want to be held and cuddled and tickled and soothed. Don’t speak Spanish? When you find yourself with an 18-month-old little guy giggling in your arms while you blow bubbles for him to chase, language doesn’t matter. As the day progresses, fellow volunteers will call you in for a delicious lunch they’ve prepared. Then you’ll get a chance to school a four-year-old on how to open their mouth wide enough to fit a giant hot dog slathered in chili and cheese, without all the toppings squirting out the side. At the end of the day, you and fellow volunteers will load back on the bus for the trip home. Everyone will share stories and pictures of their day, and you’ll come back with a feeling like no other and a desire to return as soon as possible ... I guarantee it. If you are looking for an experience that will have a true impact on your heart contact Corazon de Vida at www.corazondevida.org and sign up for one of these trips. I’ll sit next to you on the bus!